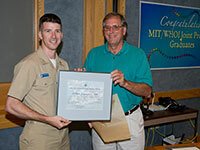 Lieutenant Ryan L. Conway receiving the Rear Admiral Richard F. Pittenger, USN (Ret) Award. The presentation took place at the 2018 WHOI Graduate Reception. (Photo by Tom Kleindinst , Woods Hole Oceanographic Institution). 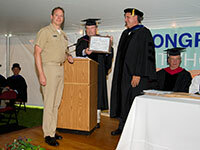 Lieutenant Scott Adams Carper receiving the Rear Admiral Richard F. Pittenger, USN (Ret) Award from Jim Yoder, Vice President for Academic Programs and Dean and Meg Tivey, WHOI Associate Dean. 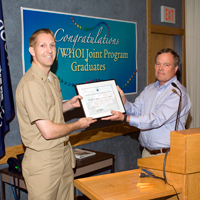 The presentation took place at the 2016 WHOI Graduate Reception. (Photo by Jom Kleindinst , Woods Hole Oceanographic Institution). 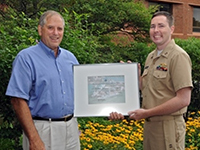 Lieutenant Thomas E. Miller receiving the Rear Admiral Richard F. Pittenger, USN (Ret) Award from Jim Yoder, Vice President for Academic Programs and Dean. (Photo by Jayne Doucette, Woods Hole Oceanographic Institution). 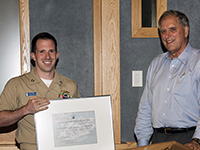 Lieutenant Matthew R. Lewis receiving the Rear Admiral Richard F. Pittenger, USN (Ret) Award from Jim Yoder, Vice President for Academic Programs and Dean and Meg Tivey, WHOI Associate Dean. 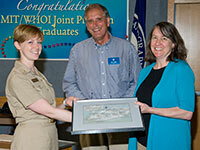 The presentation took place at the 2013 WHOI Graduate Reception. (Photo by Tom Kleindinst, Woods Hole Oceanographic Institution). 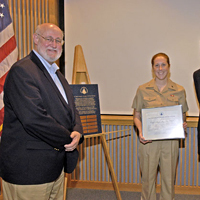 Lieutenant Commander Jennifer J. Landry receiving the Rear Admiral Richard F. Pittenger, USN (Ret) Award from Jim Yoder, Vice President for Academic Programs and Dean and Meg Tivey, WHOI Associate Dean. 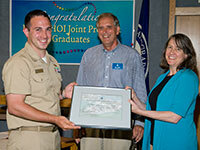 The presentation took place at the 2013 WHOI Graduate Reception. (Photo by Tom Kleindinst, Woods Hole Oceanographic Institution). 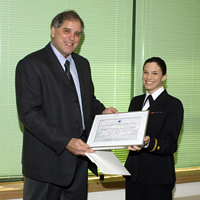 Lieutenant Heather R. Hornick, recipient of the Rear Admiral Richard F. Pittenger, USN (Ret) Fellowship, seen at the 2010 MIT/WHOI Joint Program Commencement. 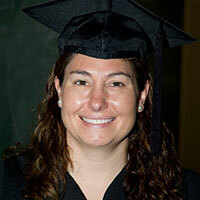 Heather graduated with a MS degree in Oceanographic Engineering in 2009. (Photob by Jayne Doucette, Woods Hole Oceanographic Institution).